The PL/SQL block that has no name is called Anonymous PL/SQL Block. Firstly the user writes the source code i.e. the Anonymous block in this case and triggers it . The end user act as the client ( e.g. SQL* Plus session ). After it is triggered , SQL *Plus sends the entire code to the Server through the network. Parsing – The PL /SQL Parser checks the code for syntactical errors and also whether the associated objects exists and are accessible. Compilation – The PL/SQL Compiler next compiles the code , Once compilation is complete , the code then enters the Execution phase. 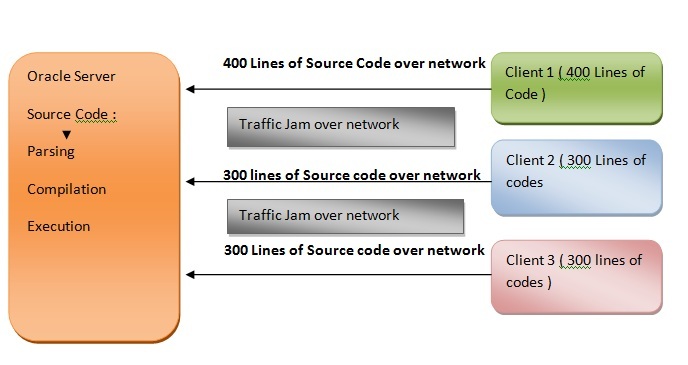 As mentioned above that in Anonymous block , the entire code from client travels over the network to reach the server , hence this creates a traffic jam on the network which causes slowness of speed. Moreover when these multiple lines of codes from multiple clients reaches the sever , parsing and compilation process happens for thousands of lines of code which causes performance issue.